The Ibans are a branch of the Dayak peoples of Borneo. In Malaysia, most Ibans are located in Sarawak, a small portion in Sabah and some in west Malaysia. They were formerly known during the colonial period by the British as Sea Dayaks. Ibans were renowned for practising headhunting and tribal/territorial expansion. 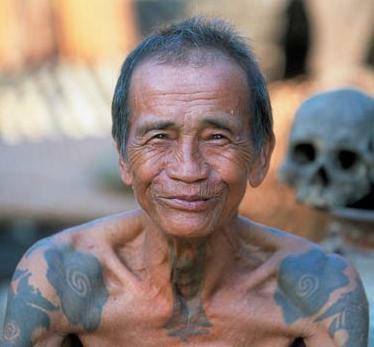 In ancient times the Ibans were a strong and successful warring tribe in Borneo. Today, the days of headhunting and piracy are long gone and in has come the modern era of globalization and technology for the Ibans. The Iban population is concentrated in Sarawak, Brunei, and in the West Kalimantan region of Indonesia. They live in longhouses called rumah panjai. Most of the Iban longhouses are equipped with modern facilities such as electricity and water supply and other facilities such as (tar sealed) roads, telephone lines and the internet. Younger Ibans are mostly found in urban areas and visit their hometowns during the holidays. The Ibans today are becoming increasingly urbanised while retaining most of their traditional heritage and culture. The origin of the name Iban is a mystery, although many theories exist. During the British colonial era, the Ibans were called Sea Dayaks. Some believe that the word Iban was an ancient original Iban word for people or man. The modern-day Iban word for people or man is mensia, a totally modified Malay loan word of the same meaning (manusia) of Sanskrit root. The Ibans started moving to areas in what is today's Sarawak around the 15th century. After an initial phase of colonising and settling the river valleys, displacing or absorbing the local tribes, a phase of internecine warfare began. Local leaders were forced to resist the tax collectors of the sultans of Brunei. At the same time, Malay influence was felt, and Iban leaders began to be known by Malay titles such as Datu (Datuk), Nakhoda and Orang Kaya. In later years, the Iban encountered the Bajau and Illanun, coming in galleys from the Philippines. These were seafaring tribes who came plundering throughout Borneo. One famous Iban legendary figure known as Lebor Menoa from Entanak, near modern-day Betong, fought and successfully defeated the Bajaus and Illanuns. It is likely that the Ibans learned seafaring skills from the Bajau and the Illanun, using these skills to plunder other tribes living in coastal areas, such as the Melanaus and the Selakos. This is evident with the existence of the seldom-used Iban boat with sail, called the bandung. This may also be one of the reasons James Brooke, who arrived in Sarawak around 1838, called the Ibans Sea Dayaks. For more than a century, the Ibans were known as Sea Dayaks to Westerners. The Ibans were traditionally animist, although the majority are now Christian. Many continue to observe both Christian and traditional ceremonies, particularly during marriages or festivals. Significant festivals include the rice harvesting festival Gawai Dayak, the main festival for the Ibans. Other festivals include the bird festival Gawai Burong and the spirit festival Gawai Antu. The Gawai Dayak festival is celebrated every year on the 1st of June, at the end of the harvest season, to worship the Lord Sempulang Gana. On this day, the Ibans get together to celebrate, often visiting each other. The Iban traditional dance, the ngajat, is performed accompanied by the taboh and gendang, the Ibans' traditional music. Pua Kumbu, the Iban traditional cloth, is used to decorate houses. Tuak, which is originally made of rice, is a wine used to serve guests. Nowadays, there are various kinds of tuak, made with rice alternatives such as sugar cane, ginger and corn. The Gawai Burong (the bird festival) is held in honour of the war god, Singalang Burong. (Singalang the Bird). This festival is initiated by a notable individual from time to time and hosted by individual longhouses. The Gawai Burong originally honoured warriors, but during more peaceful times evolved into a healing ceremony. The recitation of pantun (traditional chants by poets) is a particularly important aspect of the festival. Iban music is percussion-oriented. The Iban have a musical heritage consisting of various types of agung ensembles - percussion ensembles composed of large hanging, suspended or held, bossed/knobbed gongs which act as drones without any accompanying melodic instrument. The typical Iban agung ensemble will include a set of engkerumungs (small agungs arranged together side by side and played like a xylophone), a tawak (the so-called 'bass'), a bendai (which acts as a snare) and also a set of ketebung (a single sided drum/percussion). The Iban as well as the Kayan and Kenyah also play an instrument resembling the guitar called Sape (instrument). The Sape is the official musical instrument for the Malaysian state of Sarawak. It is played similarly to the way rock guitarists play guitar solos, albeit a little slower, but not as slow as blues. The Ibans perform a unique dance called the ngajat. It serves many purposes depending on the occasion. Iban men and women have different styles of ngajat. The ngajat involves a lot of precise body-turning movements. For men is more aggressive and depicts a man going to war, or a bird flying (as a respect to the Iban god of war, Singalang Burong). The women's form of ngajat consists of soft, graceful movements with very precise body turns. Each ngajat is accompanied by the taboh or the body. Headhunting among the Ibans is believed to have started when the lands occupied by the Ibans became over-populated. In those days, before the arrival of western civilization, intruding on lands belonging to other tribes resulted in death. Confrontation was the only way of survival. In those days, the way of war was the only way that any Dayak tribe could achieve prosperity and fortune. Dayak warfare was brutal and bloody, to the point of ethnic cleansing. Many extinct tribes, such as the Seru and Bliun, are believed to have been assimilated or wiped out by the Ibans. Tribes like the Bukitan, who were the original inhabitants of Saribas, are believed to have been assimilated or forced northwards as far as Bintulu by the Ibans. The Ukits were also believed to have been nearly wiped out by the Ibans.